Today's CIO is under constant pressure to drive out cost, without impacting business performance. And if tomorrow's CIO can deliver real business value beyond smart cost-management, then he or she will succeed - and should remain gainfully employed after they've stripped out whatever operational cost they can. Our study blatantly shows CIOs are caught up in an aggressive cycle of providing services to the business that are cheaper to run, faster to access, and more relevant to driving productivity and growth. Gone are the days when CIOs demanded their shareholders underpin massive technology investments in ERP and infrastructure. Those investments have been made, and most CEOs intend never again to make capital outlays of that ilk on technology. Enter the Cloud. This is driving a new inflection point in the provisioning of business services, that goes far beyond straightforward outsourcing. So why is Cloud the future? Simply-put, many of today's large businesses have already squeezed much of the obvious cost out of their IT departments by having their lower-end support and development needs replaced or supplemented with offshore-based services, while offloading the costly burden of clunky, unnecessary IT hardware to third party IT infrastructure service providers. For many large business that have maximized their cost-savings potential with outsourcing, Cloud computing gives CEOs hope that another inflection point is upon us, that will not only take out that next 20-30% of cost, but also empower their business functions to access best-in-class services. The potential to slim down the IT department to a "CIO and a crack team of IT service managers" is becoming very real for the sourcing-savvy organization. However, the challenge for the large organization to move to the Cloud is far more cumbersome than most smaller business, which we discussed so vibrantly here. 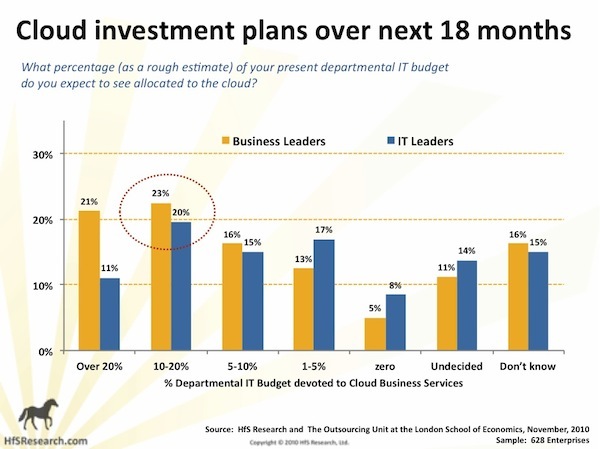 For the small-to-medum business, Cloud is already pretty much here - and has been for a while. You can access nearly all packaged applications in the Cloud and have a service provider deliver you the services you need via a shared-service utility model. You already have your Ultimates, ADPs, Netsuites, SFDCs and the like processing your pay checks, doing your benefits enrollments, managing your customer and employee data, hosting your accounts etc. in the Cloud - and you can choose how many staff to keep inhouse to service those functions for you, versus having them provisioned by third-party service providers. Unfortunately, for many of the large businesses using complex ERP apps that are wrenched into all sorts of back-end databases, they are faced with some significant capital investments to find their way to a Cloud-ready environment. And it simply doesn't suit many of the Cloud-unfriendly software providers to have their clients move to a model that will save them money. The onus is moving to the service providers to build services that can take organizations on a journey of business change and technology change, which we discuss further here. CIOs need to be seen as innovators, constantly embracing IT delivery models that provide the business with faster, cheaper and more relevant business applications. Many have had to become the conduits for IT outsourcing over recent years, as business leaders demanded cheaper IT provision. The same is happening with Cloud, as more evidence of faster, cheaper, more relevant business services materializes. Thanks to all of you who took the time to share their views with us on Cloud, and the impact they expect it to have on their organizations: we gleaned the views of over 1000 business (non-IT) executives, IT executives, in addition to industry stakeholders. This has proven to be most comprehensive study ever performed, that has used a vast social media network to canvass such a broad population of our industry. We would like to thank the Outsourcing Unit at the London School of Economics, which partnered with us to help design and analyze the study, and also John (you know who you are), who introduced us in the first place to make this all happen. Thanks for the additional data points. The one comment that I would make that there is a quantum leap between the CIO having an interest and mobilizing cloud sourcing as a solution. Of greatest concern is reliability and protective interests. Both of which are still in the discussion and semi-maturing stages. In so far as ERP it is true that they have underlying databases, and in some cases they reside in large host sites. However the ability to freely distribute these across multiple sites permits cloud flexibility on the interfacing side. A database and its related information are not a service but an asset that necessitates localized hosting. A wonderful article about the revolutionary changes that a Cloud can bring. 8KMiles(http://bit.ly/8KMiles) is a distributed development platform that blends a global talent marketplace with collaboration tools and cloud infrastructure. The 8KMiles platform allows businesses to build technology solutions at a substantially lower cost than traditional outsourcing models, without compromising on quality and security. We have been provisioning the Cloud infrastructure for outsourcing for a couple of years now and we are seeing tremendous potential and traction. 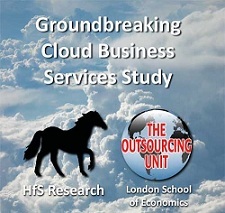 Cloud is definitely the future of outsourcing! Excellent article. We're witnessing a real game-changer in the role of the IT executive with the cloud. IT has to excel at providing cloud apps to the business, or it will discover the future of outsourcing - being outsourced! 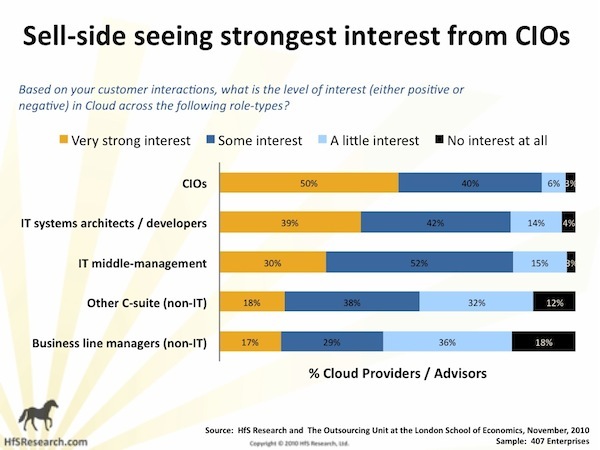 So business line managers and C-suite have little interest in cloud. This is going the SOA way.